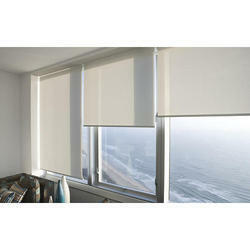 Offering you a complete choice of products which include vertical window blinds, vertical blinds and roller blinds. Vertical blinds are ideal window covering in any office, work room or public building, both from the decorative and the functional point of view. No other product combines as many features and practical advantages. Vertical blinds are easy to open and close. By tilting the vanes the sun light can be filtered efficiently, even without blocking the outside view.